Today we jump to New York City, where today, January 1st, 2017, the first phase of the Second Avenue Subway commenced revenue service. I went with my parents to the opening. From Nana’s Apartment (where we always stay for Christmas break), we took the M96 crosstown bus to 2nd Avenue. We arrived briefly after noon, in time to enter the station and see the first train pull into the station. 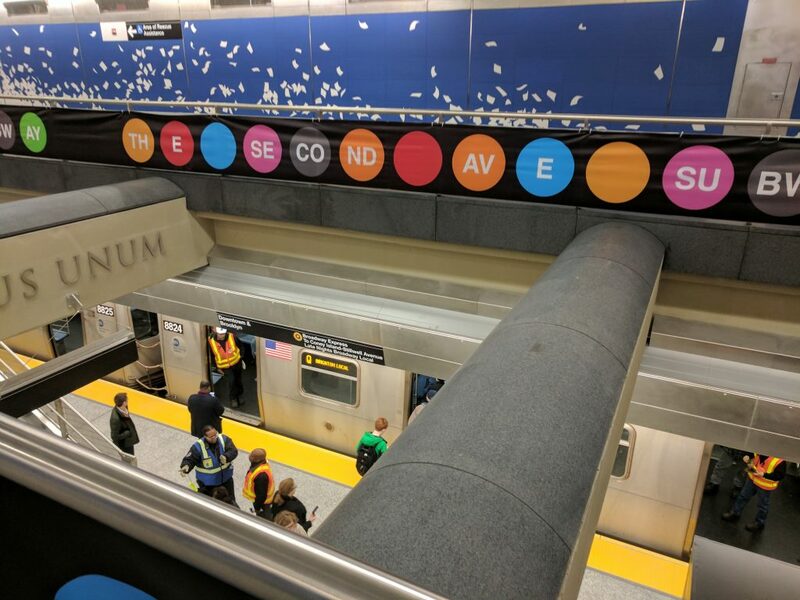 Each of the three new Subway stations on the Second Avenue line has a huge art installation built in, each done by a different artist. According to the MTA, it is the “largest permanent public art installation in New York State history.” The artwork is terrific. 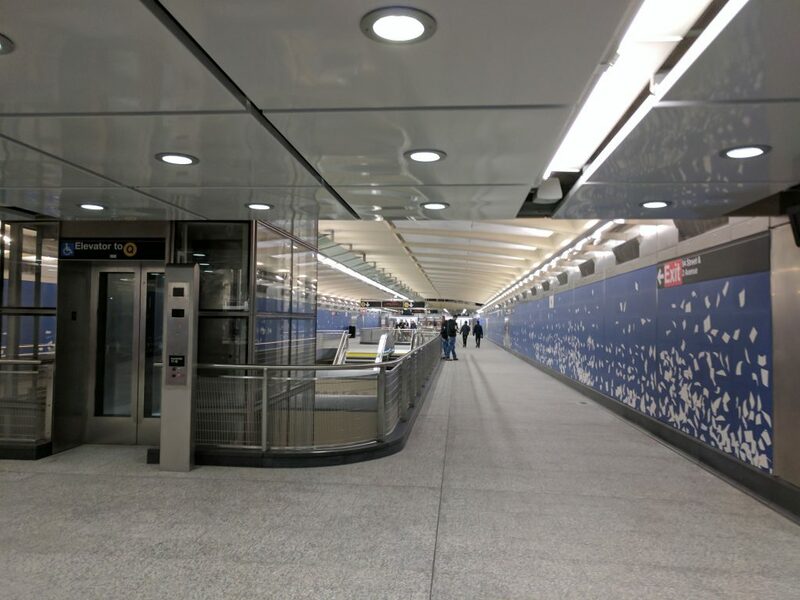 The 96th Street station features a blue and white porcelain tile installation throughout the entrances and mezzanine depicting fluttering papers. The 86th and 72nd Street stations feature various tile mosaics of people. The 86th Street station’s mosaics are larger and done in a different style than the life-size “everyday New Yorker” portraits in the 72nd Street station. The stations themselves are more uniform in layout and design. 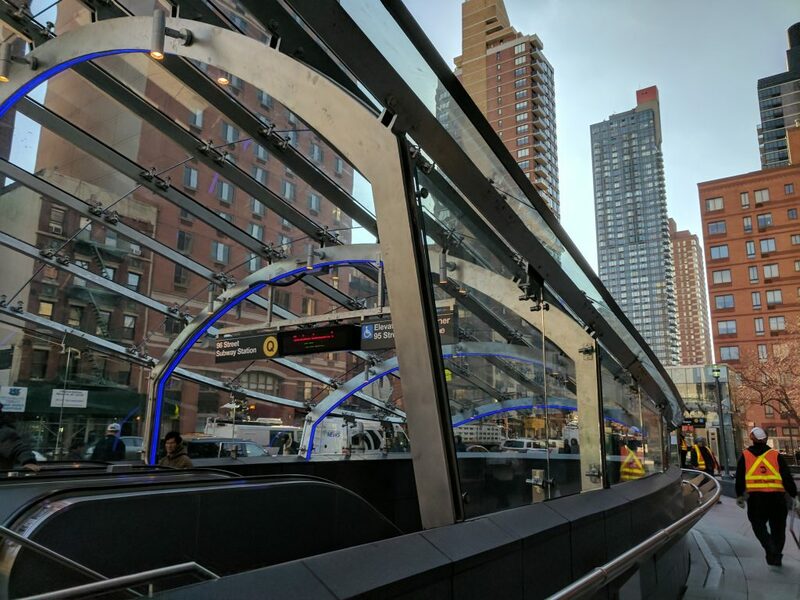 They remind me of the new 34th St-Hudson Yards 7 line station due to the column-free platform design and the mezzanine and platform layout. This seems to be the modern method of Subway station design. View of the 96th St Platform form the Mezzanine. One of the most exciting things that happened was running into Charlie Pellett, the man behind the voice of the famous “Stand clear of the closing doors, please” announcements. He was incredibly excited to be at the opening of the Second Avenue Subway, and was recording videos with fans. Naturally, I got a video with him. He even complemented my impression of the announcement, which was cool. He also signed my commemorative SAS opening Subway Diagram which the MTA handed out at entrances. It was like a celebrity encounter. 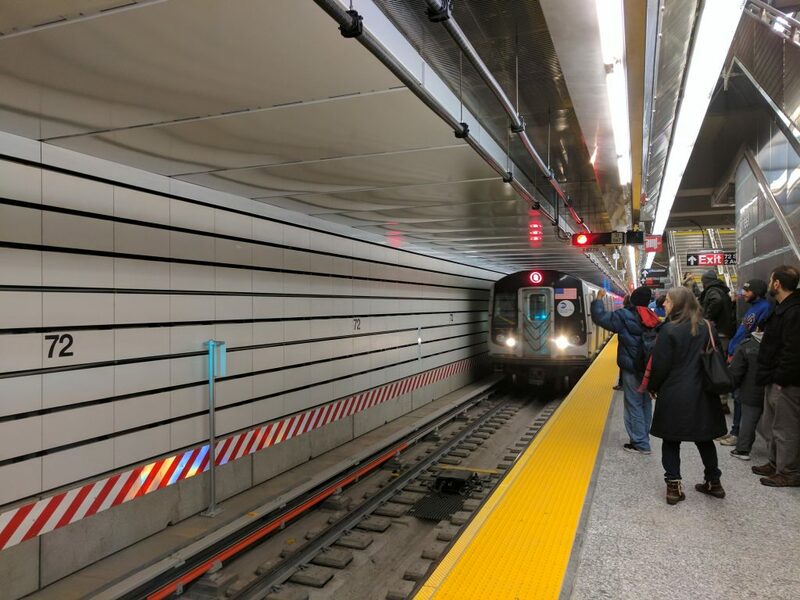 Between meeting the voice of the Subway, setting the art, and riding the trains on the brand new subway line, there were plenty of things of interest during the opening of the new subway. It was very exciting. I look forward to the future expansion of the SAS!! 96th St: The end of the line for the SAS. Next expansion: to 125th Street!